Showers and grey skies followed us the last 60 kilometres out of Denmark. It was nothing new. We were cycling on the shoulder of the main road from Haderslev to the border to Germany and traffic whizzed by us regularly. Maybe that was why my mood was a bit glum and I pondered upon, why I was leaving everybody dear to me behind (except from one) to cycle here. Then I saw the first German number plate and excitement rushed through me. I remembered that I was not just cycling in the rain on a busy main road, I was travelling. I looked around me as we passed the bay in Aabenraa. It was really nice, although nothing spectacular, but in that moment it became a particular place to me when I realized it would be a very, very long time, before I would return here. There was a big journey full of yet unknown events between this present moment and that of returning to Aabenraa some day in the future. I waited nervously for his reaction, then I received a smile that told me he was only joking. The sign to the bike route to Germany had fallen down, and so the now smiling policeman guided us away from the main road and onto the path. It went through a forest, and no signs told us exactly where we crossed the border, but on the other side of the forest was Germany with houses looking different, cycling being allowed on the footpaths and people speaking German. It was familiar, but still had that sense of something different. That feeling of travelling. We had left Denmark and the rain had stopped. As it was getting dark we cycled through Flensburg seeing the lights being lit on the boats and hills along the fjord. It was pretty. It was also rush hour and the traffic felt more chaotic than what we had gotten used to in Denmark. The cyclists went in both directions on the bike paths and when there weren’t any bike paths, we went cycling on the footpaths, but here we would be manoeuvring around pedestrians who often were on their phones, suddenly stopping or changing direction, completely unaware of other people moving around them. Out of the town we cycled in the dark, looking for a patch of forest to camp in. Half of me worried we would never find a place, but being with Chris the other half of me knew we would always find something. Suddenly, I read ‘Zum Wald’ on a road sign and I knew enough German to translate it to ‘to the forest’. And rightly, a few hundred meters later we pushed our bikes through a ditch and under the low hanging branches of the first trees and right there had a great flat and hidden spot to pitch the tent. I was really amazed that it was possible to cycle out in the country side in the pitch dark without knowing anything about what was around and yet a few minutes later snuggle up safely in our thin tent home. A few hours later I didn´t feel so safe though. Chris fell fast asleep while I stayed awake reading the final pages of Alastair Humphreys’ story about his trip cycling the world. Suddenly I saw what looked like a torch beam sweeping over and coming closer to the tent. Somebody had found us! What would they do? Chris and I had talked about the Germans generally being very strict with regulations and not being very likely to just accept wild camping. ‘Ordnung muss sein’ (Order must be kept) – another of the few German phrases I knew. They could get very angry too, as Chris had previously experienced. I turned off my torch and froze while my heart beat wildly. The light beam kept sweeping over the tent from a few metres distance it seemed, but I didn´t hear anything. Maybe they were further away? Then it turned away and disappeared. I lay still for another few minutes with my eyes wide open, but it was over. I didn´t dare to turn on my light again, so Humphrey´s final conclusions would have to wait. I thought the best I could do was to just close my eyes and try to fall asleep. Which wasn´t a problem after all. Our plan was to cycle through northern Germany and down through Holland over the next few weeks. There we would take the ferry from Hoek van Holland to Harwich in England and spend Christmas with Chris´s family there. We had planned some visits with friends on the way which gave us the opportunity to dry our stuff and get warm again if the weather should turn bad. So we headed south towards Bremen. The first highlight in Germany was to visit a supermarket like Lidl or Aldi, so we again could buy cheap chocolate, gnocchi and Chris´s favourite crisps: Flips. The biggest smile decorated his face when he filled his buffet (the basket) with all the goods and I enjoyed cycling up next to him to receive a pear, a handful of peanuts or pieces of chocolate. We had also expected to find cheap peanut butter, but left one supermarket after the other disappointed. That was another good reason to keep cycling towards the next country. There weren´t many other highlights of Northern Germany, but it didn´t mean we didn´t have a good time. We made our way south through the towns Schleswig, Rendsburg and Itzehoe. These towns were not particularly spectacular, but they held different memories to us as we had travelled through this area individually several times before and we shared these stories from our pasts. In every town, we would find a traditional Christmas market with little huts selling decorations, warms snacks and drinks. We picked up the atmosphere and bought tinsel for our bikes, so we now were riding two Christmas decorations that grew wilder as we found spruce and holly on our way. The weather was really nice to us with no rain, no wind, but many hours of sunshine blinding us as we cycled south and the winter sun was hanging lazily low in the sky. The frosty mornings displayed colourful sunrises and a mysterious fog that cows and wind turbines appeared out of. Some days the fog would hold on to the landscape all day leaving us cycling in a soft, humid nothingness. In the tent at night we played various games that ended in a final Game Night where we played all our games: Travel the World, Backgammon, Yatzy and Spit and kept a total score. Because we played two games of Yatzy, it was a draw before the final game of Spit, and it ended up being a very long and close game falling out to both sides several times. In the end I won and we didn´t play these games again for a long time. Cycling in Germany is easy with bike paths and signing everywhere, and that gave us a good opportunity to instead concentrate on playing our favourite cycling game: Spotting Things Game. In the morning, we would both write ten things to spot on ten pieces of paper. It could be: ‘Green tractor’, ‘Construction worker’ or ‘Trampoline’. We then mixed the twenty papers and draw in turns until we each had ten things to spot on our list for the day. Whoever got to ten first or had spotted the most by the end of the day won. Sometimes we would also have a Bonus Thing like ‘a yellow car’ that gave whoever spotted it first the option to take away a thing from the list or swap one thing from the other´s list. Chris was usually very keen on getting the Bonus Thing and got it before me, but didn´t always use it with luck. For example, he swapped my ‘Greenhouse’ with his ‘Newspaper’ instead of ‘Tennis ball’ which proved to be very hard to spot whereas we both soon spotted a ‘Newspaper’ in a mail box. Swapping could be a tricky one. The random draw made sure there was a risk in writing both too difficult and too easy things, as you wouldn´t know if it would end on your own list or the other’s. Until now it had created a fine balance, and there was nothing unfair about it when I drew “Three bird’s nests in one tree” written by Chris. But I still thought he´d gone too far writing that. I had never seen such a thing before. He argued that he had seen three nests in one tree many times before in winter when there were no leaves on the trees and that it would be nice for me to have a reason to look at all the lovely trees. I wasn´t convinced and grumpily I began looking for bird’s nests. I had to admit I did spot one here and there, but three in one tree still seemed impossible. Several times that day and the following we would stop to study what Chris at first was convinced was a colony of bird’s nests, but at a closer inspection seemed to be lumps of branches created by some kind of disease or malfunction in the tree. At the end of the day I had not seen three REAL bird’s nest in one tree, but it was not the only reason why I didn’t win. It didn’t matter so much who won though, the Spotting Things Game added some great excitement to our days in Germany. Bird’s nests or a symptom of a tree disease? While Dea was concerned about the difficulties of finding three bird’s nests in one tree, I had my own problems in Rendsburg, where we needed to find a way past the Kiel Canal. We weren’t allowed to cycle through the road tunnel under the water, but as this was Germany the cycle route helped us out and guided us to a pedestrian tunnel. There were escalators going down to the tunnel, but I was not allowed to use them, as I was still following my strict rule not to be powered by anything other than my bicycle and boats until I got all the way around the world (i.e. when I got back to Mori, China). Yes, seriously, I was not allowed to use escalators. To be honest, taking a fully loaded bike down an escalator was a foolish thing to do, anyway.. So instead we made our way to the elevators. Now, these were just about permitted by my rules, as they only moved up and down, and contributed no horizontal movement to my progress around the world. We wheeled our bikes in and dropped down into the tunnel. The tunnel looked surprisingly short once we rolled out of the elevators. We cycled through it anyway, and came to another set of escalators and an elevator. It couldn’t possibly be the other side of the canal already. I guessed this elevator was going to take us to another level of tunnel, where we would continue to cross under the water. We rolled our bikes in. The doors closed. A few moments later they reopened. We were outside, on the far bank of the canal already. “What are you talking about?” Dea asked. “That must have been one of those fancy elevators that move diagonally. That’s a thing isn’t it? Oh no, oh no, oh no!” I was panicking. I’d been tricked by one of those fancy elevators that move diagonally. I’d been moved a bit horizontally. Everything was ruined. All of my progress since Mori was for nothing. I was going to have to start again. We got back into the elevator and went back down into the tunnel. My mind was racing. I kept thinking about how stupid it was that they didn’t put warning signs on diagonal elevators for people who aren’t allowed to be powered horizontally by things. It was very inconsiderate of them. They just didn’t think about people like me. The doors reopened and we were back down in the tunnel. It looked a little longer this time. Maybe I’d been mistaken. “I really do think we just cycled through the tunnel,” Dea repeated. But we cycled back through the tunnel and took the elevator back up the other side. Once back outside where we’d started I went over to look at the water. The canal wasn’t quite as wide as I might have first thought. Maybe diagonal elevators weren’t even a thing. I cycled over to Dea. She was standing by some information boards outside of the elevators. On them was some information about the tunnel, including two diagrams of the layout of the tunnel, the escalators, and the very normal and straight up-and-down elevators on each side. I let out a big sigh of relief. “Yes, let’s do that,” Dea said, looking at me like I was just a tiny little bit crazy. As we cycled between Rendsburg and Itzehoe we passed a man running with a trailer pram thing. He caught my attention by not having a child, but what looked like camping gear in it. In a few confusing moments, he passed us again as I stopped to point out the German flag in a flagpole that was one of the things I had to spot in our Spotting Things Game of the day. The running man went into a bus shelter that we then passed. We saw him laying with his feet up in the air while he was singing and eating a crossaint. We stopped, looked at each other. “He is crazy, let´s go back and talk with him”. So, we did and we were right. Aleks was running from North Cape to Gibraltar barefooted (although he was actually wearing thin sandals) as it gave him a good name for his blog: barefootaleks.com, and also, he was hoping that he might impress the kids he was normally teaching. He seemed like a great guy, crazy perhaps, he was laughing a lot and, as we had heard, singing out loudly to the songs in his headphones. As we exchanged our stories, something began to come together in my mind, but could it really be? A guy running with a trailer pram thing with camping gear singing out loudly was exactly what we had seen on our way to the wedding back in Denmark. I asked which way he had gone through Denmark and if we could have seen him north of Aarhus some weeks earlier. And then things also began to fall into place for Aleks. He too remembered seeing two cyclists that struck him with the number of bags they were travelling with – which was exactly the first thing he exclaimed when we met this time. “Woah, that’s a lot of bags!”. Our ways had already passed once some 300 kilometres before and now we met again at this unspecific bus stop by a road in northern Germany. We were all quite amazed by such a fantastic coincidence, it sprinkled a little flair of magic over our journeys. We cycled behind Aleks a long time after we said goodbye as we were about the same speed. It was a bit awkward. Then he sat down on this road block and it broke. He laughed and tried to fix it, it didn’t work. Then he ran away into Itzehoe and we didn’t see him again. Northern Germany presented a repetitive scenery of farmland dotted with wind turbines and cows, traditional, old green and red wooden barns with over-dimensional roof constructions (and I wondered what great amount of hay dens, cobwebs and secrets could be kept in there) and occasionally a forest. After two days, the monotony was interrupted by the mighty Elbe River. Its waters were brown and the surrounding fields were protected from its great powers by green dikes with sheep as their watch guards. The river cut through the landscape south of Itzehoe as a fat, flat highway for container ships as a reminder of the big wide world of global trade that otherwise almost could be forgetten in the German country idyll. We crossed it on a ferry and then everything went on as before. In Bremen we arrived at our first host Sven. I´d met Sven and his friend Martin in the summer in Denmark where we were all touring. They were journalists for a German cycling magazine and had been out on a job of cycling, photographing and writing. A pretty awesome job, I thought. I knew I had liked them back then, but it still felt a bit weird ringing this stranger’s door bell. I had not needed to worry, the comfortable feeling was re-established from the second Sven opened the door. We weren’t strangers because we had an immidiate good connection despite our differences in age, culture, language and preferences. We had a great day, relaxing and chatting with Sven and his daughter. The next day Sven rode with us along the river in the city, although all we could see was a thick, white fog. He then took us to the Christmas market (which was the best we had seen so far) and cycled with us the first couple of hours out of Bremen. I liked to see Sven and Chris cycle and chat in front of me, and as I wanted to capture it I finally learned to take pictures with my iPhone while I was cycling. Look! What a success! Chris and I have the small issue that we look very much the same when we’re cycling. That is because Chris has brainwashed me to share his strong belief in always cycling in bright colours like yellow, orange or red for road safety. Obviously this is a very bright idea that we share with many other cyclists for example Sven. Together we looked like a team, I like to call us The Red Jackets. At midday the team went down to two again, and we continued on the next two days through Oldenburg and Leer towards the border bridge to Holland. 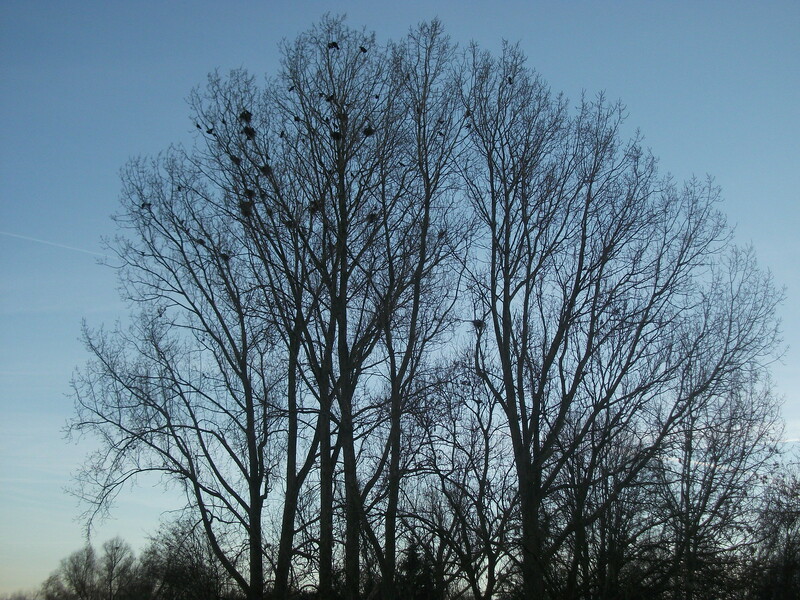 In the sunset on our last evening in Germany we saw a tree with one-two-three-more than ten REAL bird´s nests in it. Can you believe it?